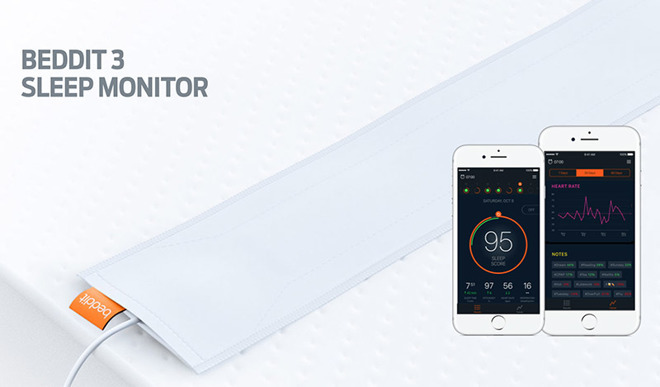 Beddit, known for its sleep tracking hardware and software, this week announced it has been purchased by Apple for an undisclosed sum. Details of the purchase are scarce, though it appears Beddit owners can continue to use their products for the foreseeable future. Currently, Beddit markets a sleep monitor that slips beneath a user's sheets to track movement, heart rate and other biometric data during sleep sessions. Armed with force, capacitive touch, humidity and temperature sensors, the thin pad is capable of measuring heart rate, breathing rates, environmental variables and more to provide a holistic overview of user sleep patterns. Owners who grant the accompanying iOS app access to iPhone's microphone can also enable snoring detection. Data collected by the sensor-laden device is automatically transmitted to a host iPhone, which subsequently stores and breaks down the information into easily digestible graphs. The goal is to improve sleep quality by tracking measurable metrics, which allows users to change sleep habits or environmental conditions. Beddit also integrates with HealthKit for comprehensive health tracking and data viewing via Apple's Health app and Apple Watch. Apple sells Beddit's latest offering, the $150 Beddit 3, through its online and brick-and-mortar stores. While Apple has yet to comment on the purchase, Beddit and its team are likely bound for the tech giant's growing biomedical engineering group. It can be speculated that Apple plans to integrate some form of sleep tracking functionality into Apple Watch, the company's flagship wearable platform. As it stands, Apple Watch's battery life precludes the device from all-day wear, though future versions might improve uptime to the point where users can wear it during sleep. Apple has increased focus on health and wellness products since the launch of HealthKit and Apple Watch in 2014, going so far as to position the new Apple Watch Series 2 as a do-all fitness device. Most recently, a report last month claimed Apple is working on noninvasive glucose sensors for tracking blood sugar levels, technology widely considered to be a "holy grail" of modern medical science.